Silver Medal Winner of the 2014 Piscataqua Press Novel Contest, chosen as one of the top three manuscripts from over 100 entries! In the future, progress demands that we dispose with old, outdated culture and look to the future. Out with the old and in with the new. However, deep beneath the city, the renegade Snitches horde treasures in the Witch Market, preserving every scrap of culture that they can and struggling to survive. Catherine Geiger was born in Rochester, NH, and has grown up a native of Durham, NH. 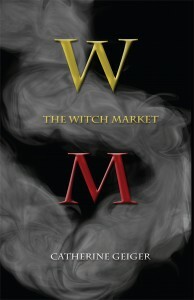 The Witch Market is her second novel, but her first to be published. She is an avid writer of many genres, but is partial to fantasy, science fiction, romance, and magical realism. She also writes poetry, which she has had published twice in Teen Ink Magazine. In her spare time, Catherine enjoys watching a variety of films, sitting in the hemlock tree in her yard enjoying nature, reading, and spending time with those dear to her. She also likes receiving flowers, online shopping, and dancing in thunderstorms.